The principles of Marxism-Leninism-Maoism (MLM) shall be the guiding force which shall inform the political practice and ideology of the Kansas City Revolutionary Collective. As an independent Maoist collective we recognize Kansas City, albeit more important than others give it credit to (it is a central hub for commerce) cannot exist in isolation, as can no other revolutionary collective in this country. With this in mind we are for the creation of a Maoist Communist Party in the United States and shall organize to create such a Party to lead a proletarian revolution composed of all oppressed peoples in this country as part of the global proletarian revolution. This party shall lead the proletariat in a Socialist Revolution in which the bourgeoisie shall be completely overthrown and the Dictatorship of the Proletariat established with the goal of elimination of all class distinctions and the eventual victory of Communism around the globe. 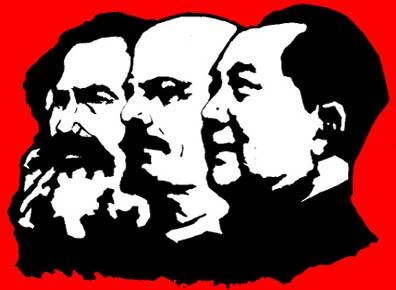 Marxism-Leninism-Maoism represents the summary practice and synthesis of over 150 years of revolutionary class struggle with four focal points: The Paris Commune, The Russian Revolution, the Chinese Revolution and the Great Proletarian Cultural Revolution. Each progressive period marked a continuity and rupture with the pre-existing modes of thinking of the day, in each one, lessons and summations were drawn only after the fact. In classifying the revolutionary ideology of Marxism-Leninism-Maoism we also are drawn to three main components in the realm of philosophy, political economy and scientific socialism. i) In the realm of philosophy Maoism has developed and stressed the fundamental law of contradiction, the unity and struggle of opposites as the principal law in nature and society. It has stressed and recognized that all unity is temporal while struggle between opposites is absolute and endless which gives rises to radical ruptures, revolutionary leaps and continuity-breaks in social struggles which was popularized in the phrase “one divides into two”. In this realm as well Maoism has stressed that the best gauge for the correctness of social theory was only through social practice and that this was the well from which all knowledge streamed, and it is only gauged if it is taken up by the masses in the millions. It is then through this in which the understanding of the “masses make history” comes together, and in providing leadership to the masses by applying the mass line by first gathering the unsystematic and scattered ideas of the masses, concentrating them and through study turning them into systematic and concrete ideas and returning them to the masses until they embrace them as their own. Through actions and the testing of ideas through social practice. ii) In the realm of political economy Maoism recognizes the reciprocal relationship between the structure and the superstructure of a given society and stresses that under socialism special attention must be paid to ensuring that the construction occurs in content and form in which politics is primary. In essence Maoism stresses that it is politics in command, that is revolutionary politics of the proletariat in command, which is the marker which determines whether the dictatorship of the proletariat exists. Maoism thus states that revisionism in command thus is the beginning of the return of the dictatorship of the bourgeoisie through seizure of the commanding heights: The Communist Party itself. As well as due to the contradictory nature of the transitional socialist economy, the Party-State, the retention of a wage-labour system, the existence of, albeit a suppressed, law of value etc. The lessons drawn here is the important role of the subjective forces and superstructure can transform the base through political power as opposed to the economic deterministic theory of the productive forces. Because of the transitional nature of socialism and the existence of the state as a marker of irreconcilable differences between classes Maoism also recognized the existence of class struggle under socialism which could be of a low-level of intensity or of a higher one (cultural revolution) but which would exist until the dissolution of classes and the state with it. iii) In the realm of scientific socialism Maoism is marked by the theory of class struggle and its existence during the dictatorship of the proletariat as well as it’s centrality in the construction of socialism. It is also characterized by the strategy and tactics of the revolution through People’s War led by the revolutionary Communist party of the proletariat, proletarian feminism, the national question, the mass line as well as the classline. i) The importance of organizing working class women in recognizing the reality of class struggle and linking the liberation of women to the struggle against capitalism and imperialism. ii) The recognition that there exists no actual feminist movement in the United States anymore as the result of seeking to organize women based on their gender rather than class interests in the primary. iii) In the realm of women’s liberation in the struggle against capitalism recognizing the reality of the wage gender gap among proletarian women and proletarian men, the feminization of industries which are typically underpaid, the slashing of social services which affect single mothers adversely, the recognition that little has changed now that male exploiters are replaced with women etc. iv) In the real of women’s liberation in the struggle against imperialism we recognize the issue of national oppression coalescing with gender in which Black, Latina, Indigenous and other oppressed nationality women face issues of sexual exploitation, violence and poverty disproportionate to white women. v) The recognition of the fluidity of gender and extension of a proletarian feminist line that is inclusive and takes up the issues of queer, trans women and non-men and how best to mobilize them on issues specific to their communities from an anti-capitalist and class perspective and as an integral part of a general program against capitalism and imperialism. As Communists, even in the premier imperialist power of this era, we recognize the role we play cannot be isolated from the struggles against imperialism and capitalism on a global scale. We recognize the existence of direct colonies as well as internal colonies existing with in US borders (Puerto Ricans, Chicanos, African-Americans/New Afrikans, Hawaiians etc) and their fundamental right to self-determination. We also recognize the importance and mission for all communists to promote the revolutionary struggles against all forms of reaction by people across the globe, particularly the Protracted People’s Wars occurring in the Philippines, India, Nepal, Turkey, Peru and are for the creation of more People’s Wars. We recognize that on the global scale one country being victorious against the bourgeoisie is not enough and that Communism is for the world or for no one. As such it is our duty to participate as a collective in constructing the Communist Party as our internationalist duty to the global proletariat. 1) The actual formation of a Marxist-Leninist-Maoist collective/organization of at least 3-5 individuals tied in with provable mass work in some sector be it student, worker or community organizing of some sort as a prerequisite towards talks. We are willing to extend our help in any capacity in offering advice to scattered individuals but it is up to Maoists in other cities to organize their cities based on their particular local conditions. We shall not orient ourselves towards individual Maoists in constructing a Party, only through collectives, accountable to the members of their individual mass organizations and the masses as a whole. 2) We seek to unite with Maoist collectivities and organizations that show an open willingness to engage in open two-line struggle and principled debate on ideological questions pertaining to building a Marxist-Leninist-Maoist Party in the US, the mass line, mass work, Maoist Philosophy, Proletarian Feminism, the national question, the global situation and a thorough social and class analysis of the imperialist centers and the United States in particular. We feel that conducting open principled debates shall allow a “Thousand Flowers to Bloom and Contend” and inspire other Maoists in this country to get their act together to form their own collectives based on ideas put forward from the debates held by different Maoist collectivities in the US. In the spirit of principled debate we are also for the collective and regular studying of questions pertaining to political economy, philosophy and scientific socialism during the process of building a Communist Party as well as talks during that process. 3) We seek to unite with Maoist collectives and organizations that recognize the necessity to building up non-tokenistic leadership from the proletariat. We are keen on developing unity with Maoist collectives that seek to immerse themselves and have a strategy to participate in the struggles of the working class as a whole through labor organizing, anti-gentrification work, tenant organizing etc. We are not closed off towards formations which are composed of petty-bourgeois leadership in class orientation so long as they recognize the necessity to building up proletarian leadership amongst the proletariat and constantly remold their petty bourgeois outlook to a proletarianized one ideologically, which shall allow them to better serve the people and conduct good communist work as proletarian revolutionaries. 4) We seek to unite with Maoist collectivities and organizations that show a willingness to formulate into theory and put into practice Proletarian Feminist politics, and building non-tokenistic Maoist leadership amongst women and queers especially from the ranks of the proletariat. Without women and non-men there can be no revolution in this country or any other one and it should be the duty of any Marxist-Leninist-Maoist organization to bridge any gender gaps which exist in leadership of the cadre and mass org level. We are for the ruthless criticism and active and provable rectification of patriarchal, transphobic and misogynistic practice and ideas, accountable to the masses alone and assert that they have no place within Maoist circles. Women and non-men do not merely hold up half the sky, they hold all of it. We seek to build unity with Maoist collectives which seek to enrich their understanding of Proletarian Feminism and the gender question in this country. We seek to learn from them and for them to learn from us as well. 5) We seek to unite with Maoist collectivities and organizations that recognize the necessity to building up non-tokenistic Maoist leadership among the Oppressed Nationalities in revolutionary mass work particularly among the proletariat. We are not closed off towards Euro-American majority formations so long as they recognize the need and are proactive in building up leadership among the Oppressed Nations and refrain from racial and national chauvinistic attitudes and tendencies. As such we are for the ruthless criticism and active and provable rectification of national chauvinist and racist practice and ideas, accountable to the masses alone and assert that they have no place within Maoist circles. We seek to build unity with Maoist collectives that take seriously the national question and the democratic right for oppressed nations to self-determination. 6) We seek to unite with Maoist collectives and organizations that recognize that we are in a strategic retreat of the Revolution on a global scale, that there are no existing socialist base areas at this current time from where we can take leadership from. That we exist in a multi-polar world where the United States is the premier imperialist power but that there are other capitalist countries seeking to compete with it on a global scale to divide the world among themselves particularly in Latin America, Asia and Africa. We also seek to unite with other Marxist-Leninist-Maoist collectivities that recognize the significance of the success of various existing People’s Wars in Peru, Turkey, India, Nepal and the Philippines and our duty to create Revolution here in this nation. On the question of the Universality of Protracted People’s War we are for unity with those Maoist collectivities that may agree or disagree on our view so long as they accept the need for proletarian revolution in this country, and are for maintaining unity with them so long as they show willingness to carry out two-line struggle on this question. 7) We seek to unite with Maoist collectivities and organizations that respect the autonomy of other Maoist formations, including our own in conducting revolutionary mass work. We are seeking and for the creation of a Maoist Communist Party in the belly of the beast but at no such time at this moment can there be a “center of the metropole” or a bias towards “big cities” based on the existence of a few more dozen Communists in relation to other collectivities, especially given the peripheral presence of their work among the masses of people in their localities. As such we are against the creation of arrogant and “Independent Kingdoms” which seek to control other collectives through bureaucratic means. We feel when there are line differences change must come from open and principled two-line struggle between collectives and not through bureaucratic measures which more often times than not stifle debate and harm the overall party building process. LONG LIVE THE REVOLUTIONARY STRUGGLE IN KANSAS CITY! Will follow your work if there is a subscription list.